The American Diplomacy Seminar provides a university-level competency for students interested in learning about modern American diplomacy and the people who make it happen. Students will go behind the scenes at U.S. embassies in Europe and North Africa to meet U.S. diplomats at the forefront of American engagement. Cultural visits, Embassy briefings, and academic lectures by IAU scholars and resident experts will place U.S. policies in their historic and geographic context, provide real-world examples of how American diplomats work, and explore the economic, security, and environmental issues they face. 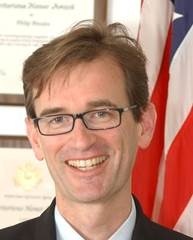 Philip Breeden is a public diplomacy advisor and educator based in France. He joined IAU in 2015 where he teaches international relations, U.S. Foreign Policy, and coordinates public affairs. Previously, as a senior American diplomat, he spent almost three decades in the United States Foreign Service creating and directing communication, cultural, and educational exchange programs in Europe, Africa, and the Middle East. He also served as the U.S. Consul General in Marseille. As a diplomat, Mr. Breeden received numerous awards including a Superior Honor Award for his public diplomacy efforts in Tunisia, the Palmes Académiques for his work with high schools in France, and the Secretary of State’s Career Achievement Award. He holds a B.A. in International Relations from Stanford University and a M.A.L.D. from the Fletcher School of Law and Diplomacy. He speaks French, Arabic, and Turkish. Program fees include tuition for 3 credits, lodging, insurance, entrance fees to all museums and guest lecture venues, Intra-European transportation to and from each city, breakfast daily and some dinners.